Fresh off completion off a furniture-quality bookcase and beautiful sanded, finished live-edge shelves, our oldest builders started in on...a mechanism for smashing things. The Smash-o-Tine (as opposed to guillotine) will guide an 83 lbs. section of salvaged railroad track from a rack six feet above the ground to an unwitting piece of fruit on a (heavily-reinforced) platform below. The Smash-o-Tine is playful, but also represents to serious engineering challenges: the safe management of an enormous amount of energy, and a tight timeline--next week is our final meeting. Today we finished our bookcase and live edge shelves, and installed them at the entrance to Tinkering School. Ethan, Dexter and Trent focused on cladding the bookcase in strips of 2x3 re-sawed on the bandsaw. The bandsaw gives the piece a nice rustic texture. Asa and Panu focused on assembling the home-welded shelf brackets to the live-edge shelves that we made from a redwood log. Along the way they discovered some imperfect welds. Mistakes are, of course, part of the process--and so is fixing them. We went right to work on fixing the brackets. By day's end the bookcase was in place and one of three shelves was up. It's really cool that every little part of the Tinkering School library was made by our young builders. Except the screws and nails--for that we'd need a forge. Our oldest crew made major progress on the Tinkering School Library today. Asa focused on welding brackets for our live edge shelves, then grinding down the welds. Trent, Ethan and Dexter started the demanding, precise work of cladding the bookshelf carcass in thin, random-width strips of cladding. Between the live-edge shelves and the clad cabinet, we should have a nice, rustic-looking Library soon! We got to use loads of fun tools as we built our library today. Ethan and Dexter busted out the pipe clamps to complete the carcass of their bookcase. The carcass is made only from off-the-shelf fraing studs, but thanks to their care and precision, it came out extremely square. (Sorry, we were all too busy to snap a photo!) Next week we'll clad the carcass in strips of softwood, matching the rustic feel of our shop. Sam and Asa used the portable bandsaw and MIG to weld some sleek brackets for wall-mount shelves, while Panu and Trent used the bandsaw, planer, and random orbital sander to make boards from a redwood log over 14" diameter! Today was the first day of construction on our library. Ethan, Dexter and Panu decided to work on a wooden bookcase clad in bandsaw-textured siding. They had experience on all of the tools required, and got right to work. As for Asa, Sam and Trent's floating steel bookshelves, those would require a new tool: the MIG welder! 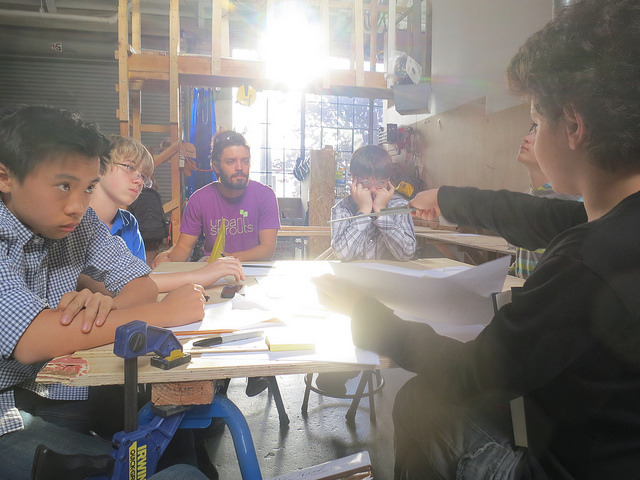 Tinkering School After School Seniors is a place for older builders to 1) tackle complex, open-ended problems; and 2) learn to use tools not just safely, but precisely and efficiently. After practicing on the chop saw, band saw and drills, we started in on our first challenge: Build a pair of stilts that can be used to safely walk the perimeter of our space on Bryant St--about 300 yards. Builders dreamt up solutions to problems like foot platform stability, traction, and handles, and freely swapped ideas. By the session's end, we were making our first steps--small, slow, and a bit wobbly, but definitely forward.